Vienna has various iconic images…the cathedral roof, the giant Ferris wheel, the Danube, the lights at pedestrian crossings. Um, hang on…the what? Yep, the pedestrian traffic lights. Since their appearance in 2015, the “couples” red and green symbols have proved a huge hit with both visitors and the world’s media. You can thank the singer, Conchita Wurst, for the lights. Back in 2014, Conchita’s rousing performance of “Rise like a Phoenix” won the Eurovision Song Contest for Austria, a win that came with the privilege of hosting the following year’s event. (For those who don’t know, the Eurovision TV spectacle is a big deal in Europe, attracting over 180 million viewers each year). In honour of the 2015 contest, held in Vienna’s Stadthalle, the city authorities took the opportunity to make a statement on gender equality by installing “couples” red and green lights at around 50 locations. 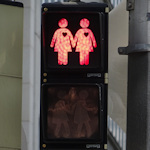 Each light has either a mixed, all-female or all-male couple in both “stop” and “go” versions, each one generally features a heart somewhere on the image. The original plan was to take the lights down after the event, but they proved so successful that they stayed. As well as their value as a social statement and tourist attraction, the new symbols actually improve road safety. A study revealed that fewer people cross the road at red when the lights feature the couples, rather than the usual single man. On my travels, I’ve been marking the couple lights as I come across them. The map below shows those I’ve found so far (you can tell which side of Vienna city centre I live on). You should come across them at many of the tourist hotspots, such as around the Rathausplatz and up the main shopping street (Mariahilfer Straße).